Jake was notable for his atypical facial features, and shortened, curved legs (dwarfism) – evidence that his birth was the product of inbreeding, which is very common in roadside zoos and other unscrupulous facilities that breed tigers to produce cubs for public handling and photo sessions. Jake was a favorite of the care giving staff at PAWS. He had a cheerful, easy-going personality and was always eager to greet people with a friendly "chuff." His short legs and unusual facial features gave him a unique appearance and made him easy to recognize. As supervisor Renae fondly recalls, he loved everyone and everyone loved him. 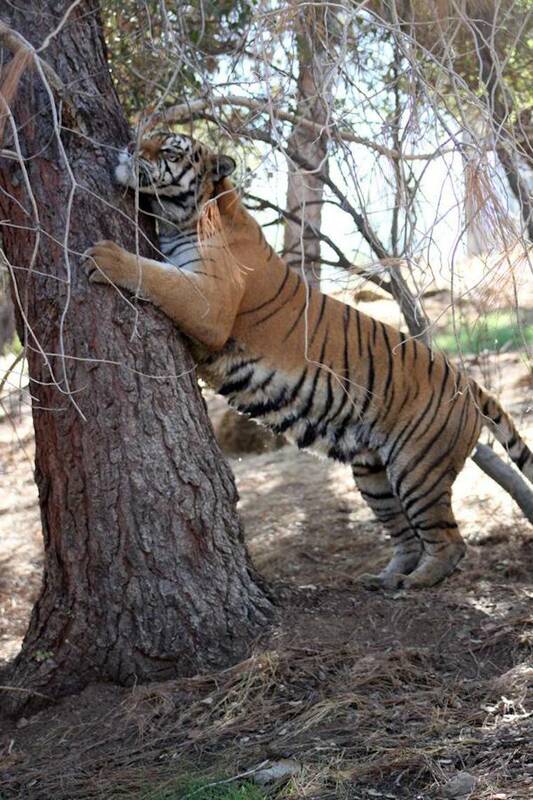 Tigers by nature tend to be loners, or at least very selective about which tigers they want to be near, but Jake welcomed all tigers with whom he came into contact through the fence line, greeting them with a chuff and an affectionate head rub as if to say "welcome to PAWS!" Jake was one of three tigers rescued from a failing facility in Ohio that was forced to close its doors due to financial problems, looming revocation of its exhibitor’s license due to unsafe enclosures, and increasingly tough regulations. 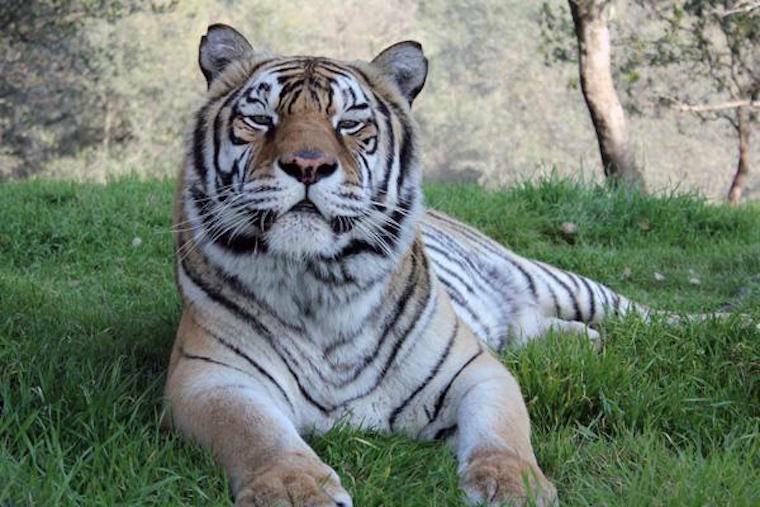 The tigers arrived at PAWS' ARK 2000 sanctuary in June 2012. Jake was notable for his atypical facial features, and shortened, curved legs (dwarfism) – evidence that his birth was the product of inbreeding, which is very common in roadside zoos and other unscrupulous facilities that breed tigers to produce cubs for public handling and photo sessions. Jake had also been declawed on all four feet, and he sucked his tail occasionally, a sign of being weaned prematurely from his mother. Declawing big cats can cause them to have painful, crippling deformities in severe cases, and at the very least can change the way they bear weight and predispose them to developing arthritis at an early age. Jake's malformed legs and declawed paws probably contributed to his development of arthritis at the age of 14. Active and playful, Jake thoroughly enjoyed the grass, trees, logs, and large habitat at ARK 2000. When he had a sudden bout of illness in early 2016, PAWS' veterinarians diagnosed kidney disease and arthritis. Once he began receiving special supplements and medications for these conditions, he quickly bounced back to health and continued to be active and happy. In late January Jake's appetite began to decrease, and after performing a comprehensive physical exam under anesthesia our veterinarians discovered that his kidneys were failing. Throughout his illness, Jake remained friendly and cooperative, taking his medicines well and enjoying the extra TLC provided by caregivers. When Jake’s condition continued to decline, and it was clear that his kidney disease was not responding to treatment, the most difficult but compassionate decision was made to gently euthanize him to prevent future suffering. He passed from this life on February 19th, surrounded by the love of many who cared for him. Jake was almost 17 years old at the time of his passing, and will be tremendously missed.